You're going to love living at The Condominium Residences at Seven Bridges...golf, shop, work out, dine, enjoying the view. but in time you’ll get used to everyone envying where you live. And to help you get ready for the envy of your friends and family, we're making our floorplans, brochure and area map available as downloadable, printable PDF formatted files. Let the drooling begin. * floorplans also contain applicable features/amenities. 7 floorplans to choose from. 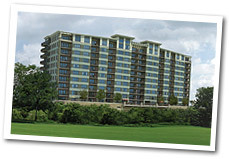 1-3 beds, 1-2 baths, dens per plan, golf course view, balconies and indoor parking from the $270’s - $500's. CALL NOW FOR INFO ON LIMITED TIME CLOSE-OUTS! Sales center open Monday, Friday & Saturday 10 a.m. to 5 p.m., Thursday & Sunday 12 p.m. to 5 p.m., and Closed on Tuesday and Wednesday. One of the best parts of living at The Condominium Residences at Seven Bridges is that it is at the heart of one of the finest locations in Woodridge. You’re within walking distance of downtown shops, casual and fine dining and nearby parks and amenities.